The Alumni Spotlight is an interview series where we interview Asia Studies alumni about their career paths, how they became interested in Asian Studies and for any advice that would be useful to our students. This interview features Alison Winters, BA ’89 in China, Chinese Poetry in the Tang Dynasty (618-907 A.D.). Since then, she has started her own consulting company specializing in Event Management, Marketing, and Canada China business and relations. I was born and raised in Hong Kong. I immigrated to Canada in 1982 and came to Vancouver from Ottawa to attend UBC in 1984. Ever since I was small, I was always interested in studying Chinese literature. When I came to UBC, I decided to follow my heart and study what I like. I remember I took 18 credits in Japanese language studies for my undergrad degree. In retrospect, it was an excellent idea as it forced me to be open minded, embrace cultural differences and try to learn and accept how other people look at the world and think. I learned to pay more attention and respect different cultural values. I recommend other students learn at least one different language other than English and French. We will broaden our horizons and be able to reach out to more people. Being monolingual is very limiting. I was very fortunate. Upon graduation, there was an opening at the David Lam Centre (DLC) for International Communication at Simon Fraser University at Harbour Centre. I applied for the job right away. The mandate of the DLC is to foster intercultural communication and understanding between Canada and the Asia Pacific region through language and cultural training, forums, seminars, workshops, and conferences. It also organizes public events related to Asian art, history, film, literature, and philosophy. The fact that I understand, speak, and write Chinese (including Mandarin Chinese and Cantonese) and some Japanese helped secure the job. It was a very simple and smooth transition. It was fascinating for me to meet with so many academics and experts in the field of cross cultural communication. I learned a lot. This photo was taken at the Grand Ballroom at the Great Hall of the People in Beijing, China on November 8, 1994. 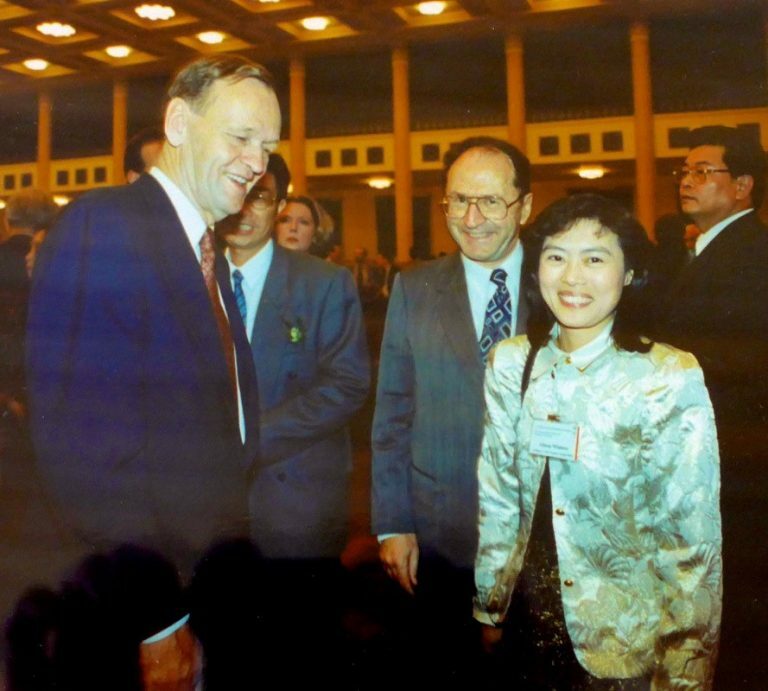 Prime Minister Jean Chretien led the First Team Canada Mission with all the Premiers (except Quebec) and territorial leaders along with over 400 senior executives to visit China in 1994. Here, the Prime Minister congratulates Alison Winters for the successful banquet. I worked at DLC at SFU for five years. In February 1994, a job opening came up at the Canada China Business Council (CCBC) Vancouver Office. Canada China Business Council planned to open its Vancouver Office. As I wanted to be more focused on Canada-China business and relations, I sent in my application, wrote the written test, and attended three interviews. In the end, I got a job offer from CCBC and worked there for over 20 years. I resigned in July 2014 and started my own consulting company specializing in Event Management, Marketing, and Canada China business and relations. I enjoy my current job because I choose what I want to do and when I want to do it. I have a lot of freedom. A challenge in Event Management is that there are often many unexpected changes. Even though you plan very well and look after many details. Inevitably, there are many unexpected last minute changes in the Event Management line of business. In the last minute, some very important VIPs may show up at the event or some VIPs will cancel their appearance. According to protocol, I have to adjust their speaking order and seating arrangement as quickly and seamlessly as possible. So, I have to keep my composure under pressure and be very creative in solving problems. I have to be very quick at thinking on my feet. On the Marketing front, if it involves a 3rd party, it is difficult for me to control the quality of their work particularly, if the 3rd party is not located in Vancouver. I can do my utmost to fulfill my duties and deliver my promises; however, I can only request the 3rd party to do their job but I cannot control the quality of their work. I am at their mercy. working at an educational/governmental organization/private company marketing Canada or BC to China or Asia. helping educational institutions recruit students in China/Asia to study in Canada/BC. Yes, it has most certainly. Personally speaking, it is best to specialize in a field that you are good at, passionate about it, and believe in its potential and impact. At the same time, be proficient in another language/languages. It will carry you further and open more opportunities for you. It is a great bonus and will make you stand out in the crowd. Having language skills alone without other specific skills will not take you very far and will not make you very employable. When it comes time to choose a career, have courage to follow your heart. Believe in yourself. Find out what you want to do. You may not know it right away and it may take a few jobs to find that out. It does not matter where you start and how little your first job pays you. Be enthusiastic and strive to learn as much as you can. Be willing to do things that do not fall into your job description. No job is too small. Get the job done no matter how difficult it is and how long it takes. Engage with an open mind and an open heart. Be open to other people’s ideas and suggestions. Other people’s ideas may work too. Try to see it from their point of view. You may learn something new. If we insist our way is the only way, we will become a one trick pony and pigeonhole ourselves. Make yourself versatile. We will not accomplish very much based only of what we already know. Never stop improving yourself. What you have learned is yours to keep. Nobody can take it away from you. This investment will pay you huge dividends for the rest of your life. Learn money management and time management and learn them well. Where possible, put some money aside and take time to see the world. Acquire great interpersonal skills. Do not wear your emotion on your sleeves. Try to get along with your colleagues; they do not have to be your best friends. If you don’t get along with them, you will have a problem. You will be unhappy; the work environment will become unpleasant and you will lose in the end. Ace in problem solving skills. You will become an integral part of the team. You will be highly valued and sought after. Find ways to broaden your horizons and contact base. Be vigilant in doing following up. When you leave a company and move on to another, they will be your contacts as well. Establish your reputation in knowledge, skills, thought leadership, integrity, and professionalism. You will become an excellent leader. People will remember and respect you and will not hesitate to refer you to others. Be happy and enjoy living your life. The best is yet to come. Don’t sweat the small stuff. You have the magic and power inside you to create a life that you want and a career that you would be proud of. I sincerely wish all graduates a very gratifying and rewarding career.